Preheat a deep fryer to 160C. Combine all the dry ingredients in a mixing bowl. Add water gradually while whisking until all the flour is combined and the batter has the consistency of double cream. 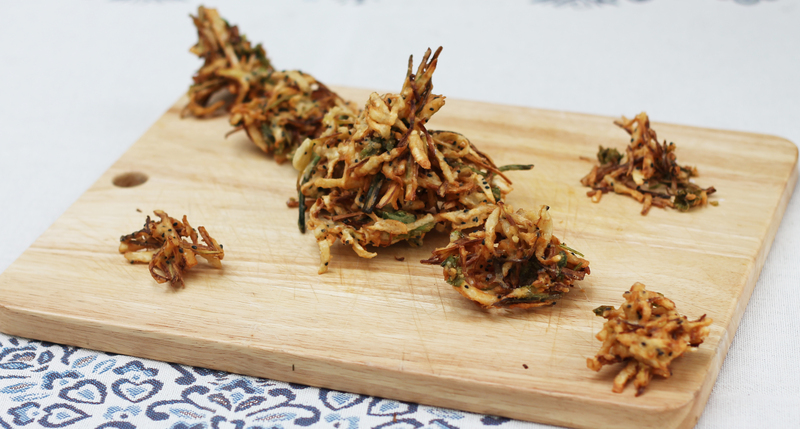 Toss the leeks, celeriac and fresh coriander together and mix into the batter with clean hands. Try to get all the vegetables evenly coated with batter. With the fryer basket lowered, grab a small, loose handful (ping pong ball sized is about right) of battered vegetables with your fingertips. Form together with a gentle pinch and allow any excess batter to drip off. CAREFULLY drop the ball into the hot oil – taking care not to allow the hot oil to splash you. If you have any doubts about your ability to do this safely, use a pair of tongs. Work in batches so as not to overcrowd the fryer and ensure the oil heats back up to 160C between batches. Fry for 3-4 minutes or until golden brown all over, flipping the fritters over half way through the cooking time. Remove fritters from the oil and dry immediately on paper towels. Sprinkle with a pinch of salt and serve straight away. Vegetables for this recipe that have with a uniform profile (like parsnips, carrots, courgettes and celeriac) can just be grated on a cheese grater. Onions and leeks are better chopped by hand, so as to yield long strands. 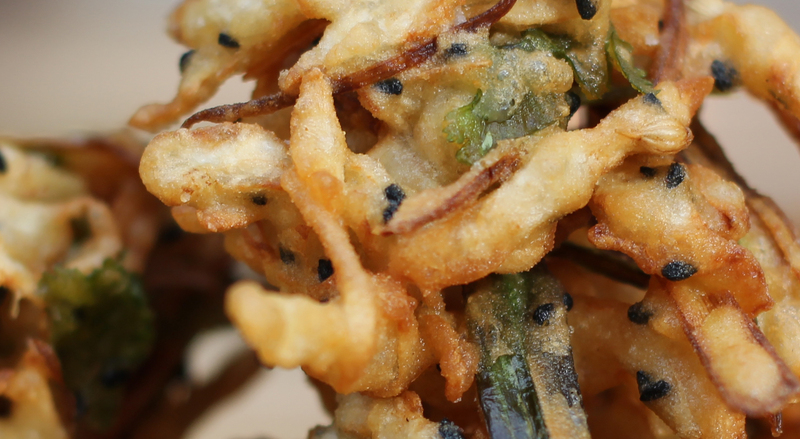 The goal for the fritter mix, broadly, is to get lots of strands of vegetables loosely entangled with each other and held together by the batter. In this way, you get extra surface area, which equals extra crunchiness. If you’re having difficulty coating the vegetables evenly, the batter may be too thick or too thin. 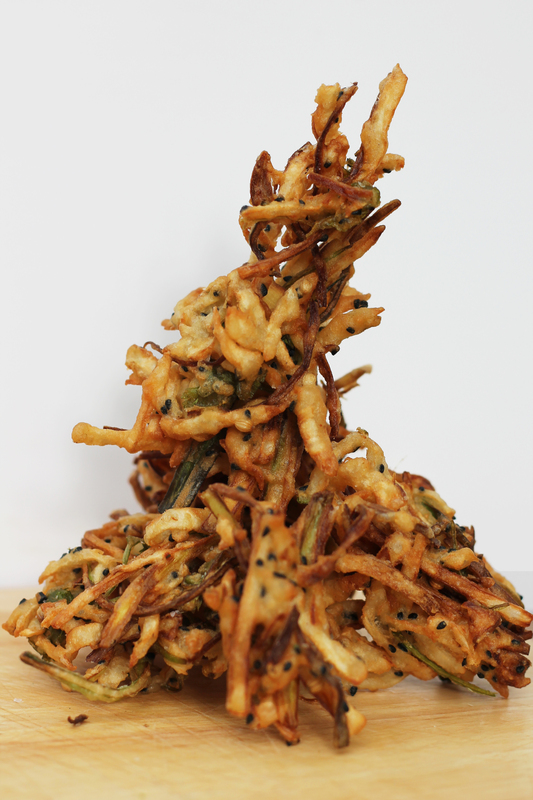 Its not too late to adjust this – add a little bit of water or gram flour and toss well to combine. 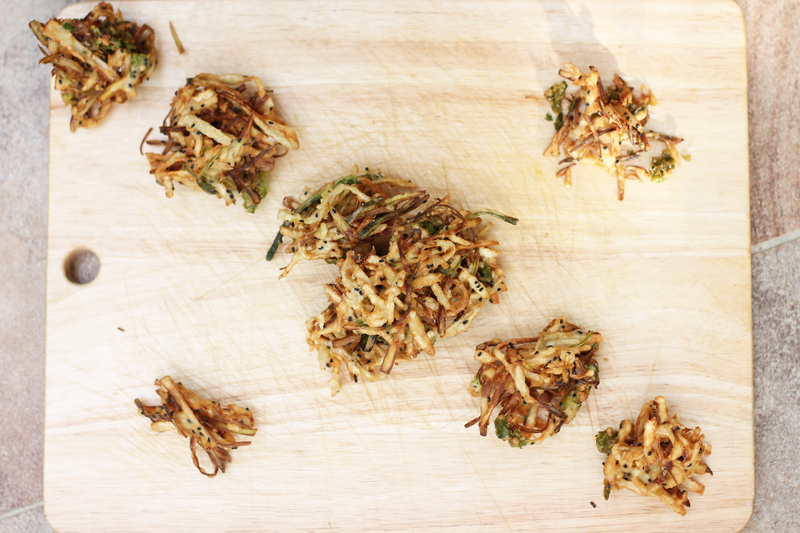 If the vegetables are well coated but the fritters won’t hold together in the fryer, the batter is too thin. Sprinkle in a handful of flour, toss and try again. There’s not much more geeky stuff to say about the recipe itself – its a very simple dish. However, I promised tips on deep frying, and there’s a lot I can say about that. The six volume cookbook/work of madness that is Modernist Cusine has really great information on deep frying (and everything else). I’ve summarised a part of their article into tips here. Blotting excess oil off food after deep frying with a paper towel makes it healthier and less greasy. Merely draining it on a rack is not as effective because the surface tension of the droplets of oil keeps them from dripping away. Its best to blot as soon as possible after the food comes out of the fryer; as oil cools down it becomes more viscous and harder to remove. It also has more time to be absorbed into the crust. The violent bubbling you see when you drop something into the fryer is water turning into steam. Water near the surface boils almost as soon as it touches the hot oil. 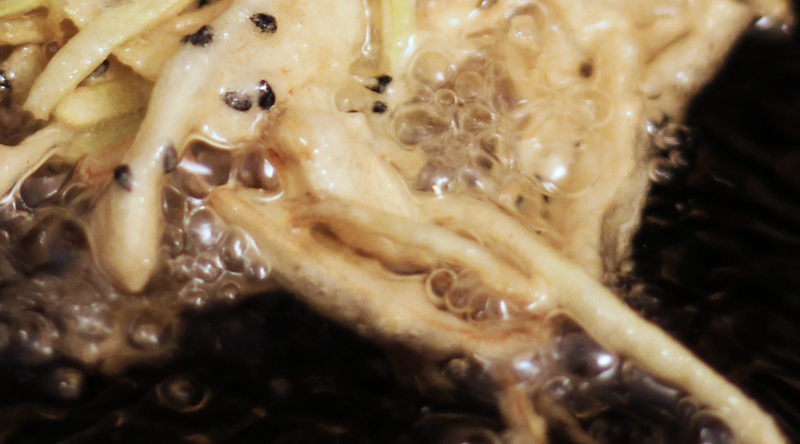 This pushes oil away from the surface of the food and prevents it from seeping into the interior. So long as the intense bubbling is going on, the water has not yet all boiled off, which means that the surface temperature of the food cannot be more than 100C. Once the bubbling slows down, the surface is dry, so temperature can rise, which leads to the sugars and starches in the food caramelising and turning brown and crispy. The bubbles also have the effect of stirring the oil. This induces convection currents which makes the food cook faster – just like a fan oven does. Cooler oil near the food is disrupted by the bubbles and stirred into the hotter surrounding oil. Batter is a classic way to protect delicate food for deep frying. The water in the batter boils off and leaves behind a superb crust. Beneath the batter, a layer of cooler, humid air develops. The food within is protected from the scorching hot oil so it stays moist and tender. It takes a lot of energy is required to turn water into steam, and this energy comes from the heat of the oil. A deep fryer will cool down dramatically when you drop the fritters into it, especially if you do a large batch. The fryer should come back up to temperature fairly quickly, but if it doesn’t, preheat it to a higher temperature and turn it down when you put the batch in. Its also worth knowing that the thermostat on a deep fryer can quite easily be running 10C out. Its worth taking the temperature with a digital probe thermometer to calibrate. Unlike water, oil isn’t just a neutral medium for cooking. Its an ingredient that is itself cooked and changed by heat. As such, cooking oil has a peak. Fresh oil has very little odour or taste to impart to the food. Old oil has rather too much odour and taste to impart. Peak oil has just the right amount of each. You can bring fresh oil to its peak very quickly by adding just a couple of spoonfuls of older oil to it. Old oil needs to be discarded. If it smells bad or foams up when you drop something in it (NB: foams, not just bubbles), get rid of it. If you’re like me, you may have wondered (whilst cleaning the bloody thing) why a deep fryer is designed to have a heavily indented heating element with a large surface area that sits in the oil rather than just heating the oil directly from below in a smooth pan that you could scrub in about thirty seconds. The reason is so that the small crumbs of batter or potato that fall off the food when you fry it will sink to the bottom. Placing the element above them means that they are in cool zone, so it keeps them from burning (for a while) and imparting their taste to the oil. Very informative and extremely tasty. Thank you for the interesting and (for me) new recipe. I am tired of french fries. This sounds really lovely.